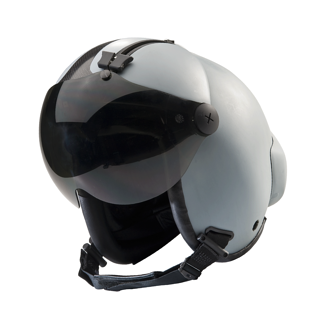 More affordable, and based on the legendary, combat proven, Joint Helmet Mounted Cueing System, or JHMCS for short, JHMCS II is an improved helmet mounted display system incorporating today’s enhanced technology. JHMCS II is the worlds’ first high definition, color, smart-visor that operates in both day and night mode. The JHMCS II system is equipped with the most innovative head-tracking technologies available - allowing a pilot to aim sensors and weapons and receive increased situational awareness in whatever direction he or she is looking. Proven symbology, now combined with color, creates a superior system that provides intelligent vision in the cockpit. It provides immediate and accurate recognition of friendly, threat and unknown targets and areas to create a complete view of the air, ground and sea picture for the pilot and aircrew. This is accomplished with time-proven software that integrates accurate intelligence with images, video and sound. Pilots flying with JHMCS II will have a decided advantage when they observe, orient, decide and act.